Though we’ve been focused this week on the election, Monday we observed All Saints Day, the holy day when the Church commemorates all saints, known and unknown. 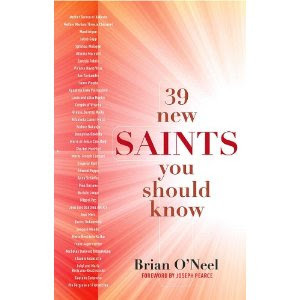 With over 10,000 named saints throughout church history, it’s not practical to think that we’ll know about all of them, but Brian O’Neel writes about 39 New Saints You Should Know in his new book. This beautifully organized book introduces the reader to men and women canonized or beautified between 1977-2008, providing short biographies of their lives, and ending each chapter with a prayer asking God to help us recognize and emulate that person’s special quality in our own lives. During his papacy, Pope John Paul II canonized 482 and beautified 1339 individuals. The author highlights 30 Blesseds and 9 Saints, which in my opinion made the title slightly misleading, since those beautified are not officially Saints, though they are on the path to official Sainthood. However, without including those Blesseds, we would not be reading the powerful stories of Blessed Ignatius Maloyan, martyred in 1915 for not converting to Islam, or Blessed Maria Restituta Kafka, a world-class surgical nurse beheaded by the Nazi party. It is shocking to consider that “more Christians lost their lives for their faith in the 20th century than in all the previous nineteen centuries combined,” until you begin reading about the blessed and saints martyred during World War II. Men and women like Blessed Franz Jagerstatter, executed for being a conscientious objector who offered to serve as a paramedic when impressed into the Nazi Army, but refused to fight. Ironically, his beheading occurred on the same day that St. Edith Stein was gassed at Auschwitz. The stories offered in 39 New Saints You Should Know connect us with these new Saints. On the surface, these men and women appear to be ordinary people, though the stories reveal their deep and abiding faith. They are “witnesses of the courage we need to stand firm in the face of secularism, the culture of death, and other evil forces.” Their lives serve as inspiration to us that we too can live our faith with courage and conviction, either out loud or quiet and prayerfully, humbly in service to each other and the Lord. This review was written as part of the Catholic book reviewer program from The Catholic Company. Visit The Catholic Company to find more information on 39 New Saints You Should Know - and be sure to check out their great selection of Advent wreaths and prayerbooks while you are there.